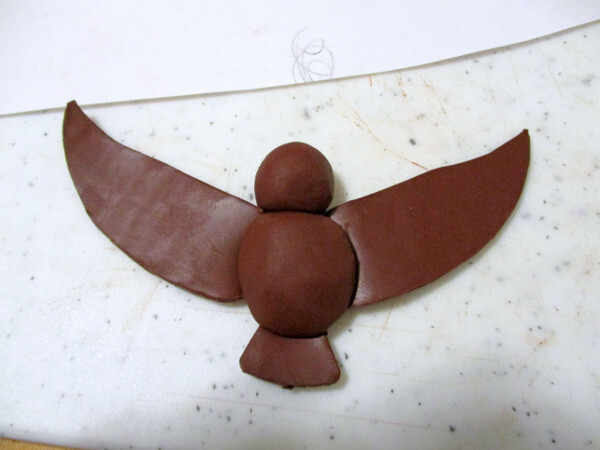 Sketch out a bird shape leaving some part of the wing and tail overlapping. 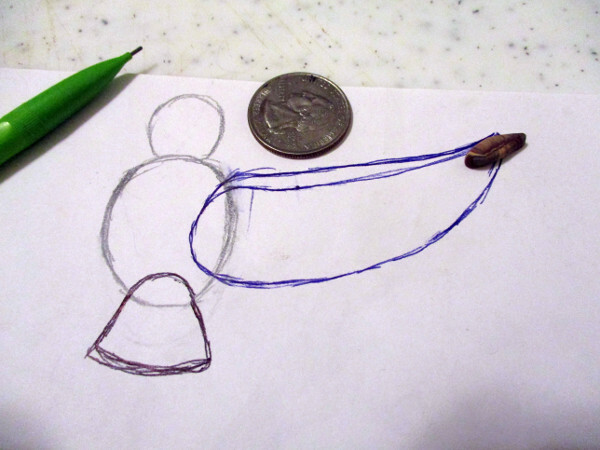 You only need to draw 1 wing since you can flip it over for a mirror replica of the first wing. Run brown clay through your clay machine at a setting 1. 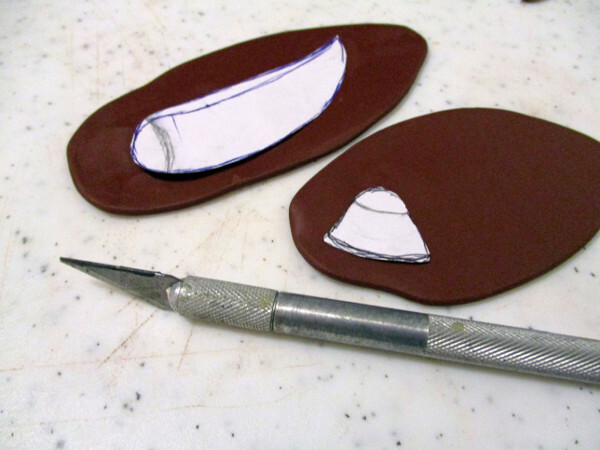 Cut out wing and tail shapes from your sketch and place them on top of the clay sheets. Treat them as stencils and use a hobby blade to cut out your shapes. Remember to just flip your wing stencil over to cut out the second wing. 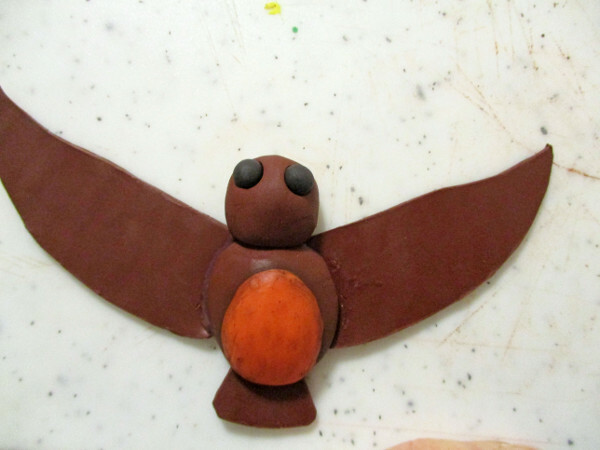 Use your original sketch to position wings and to shape head and body size. Use the flat silicone ended tool in your detail tools kit to smooth your wings and tail into the body by gently dragging the tool. 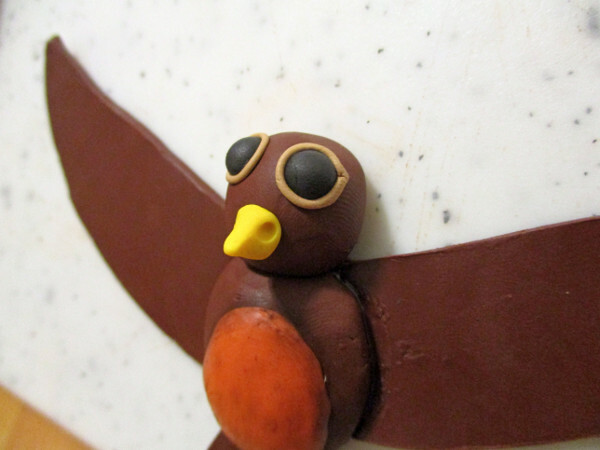 This helps bond the parts together and adds strength to the wings. 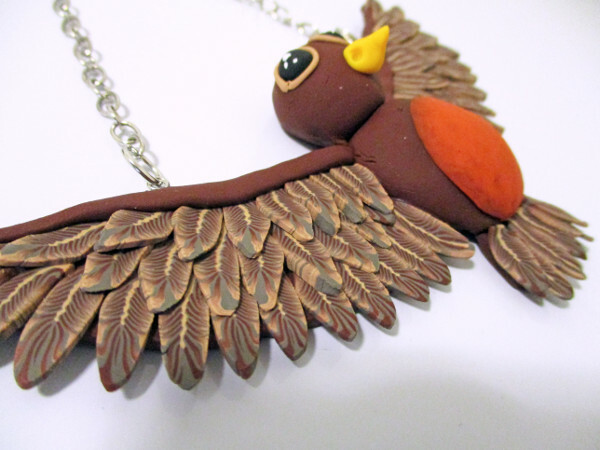 For extra strength add a thin bead of liquid fimo where the wings meet the body on the front of your work. Use your medium sized ball detail tool to create eye sockets. Roll our black balls of clay the same size of the ball detail tool and gently press them into the eye sockets. 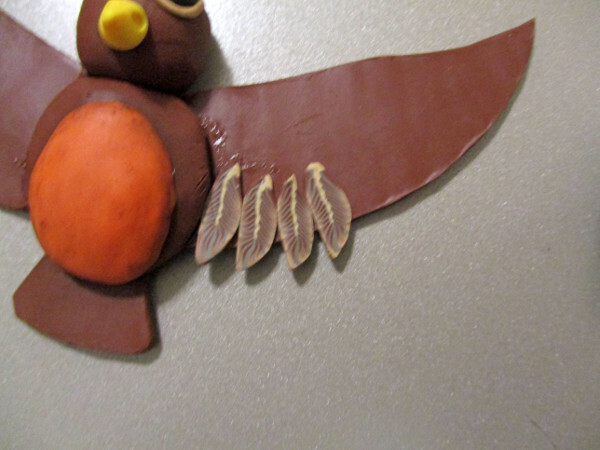 Mix a little brown with orange and create a thin flat oval for the robin’s belly. I used some brown chalk shavings (painted on) around the edges of the belly to create a blended look. Roll out small canes of beige clay to go around the eyes, trim with a hobby blade where the ends meet. 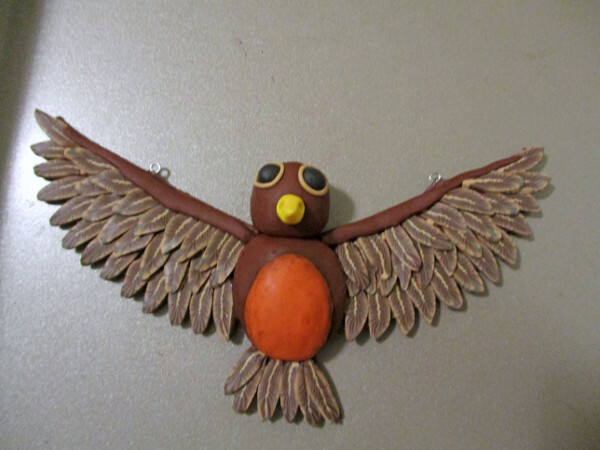 Make a small cone out of yellow clay for a beak. 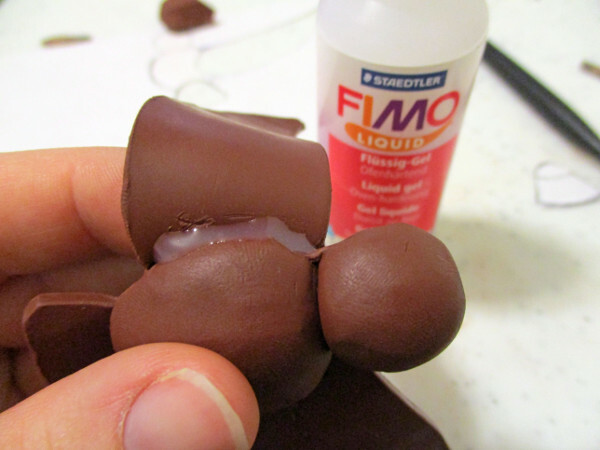 Create 2 small nose holes with your smallest ball end detail tool or a toothpick. 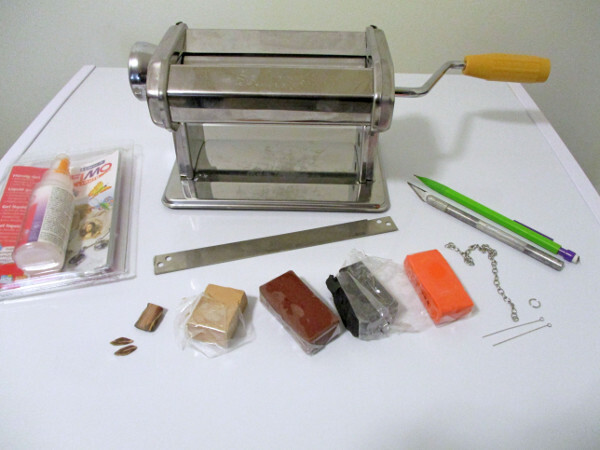 Use your super slicer to cut slices off your feather cane. Start at the bottom for your first layer of feathers. 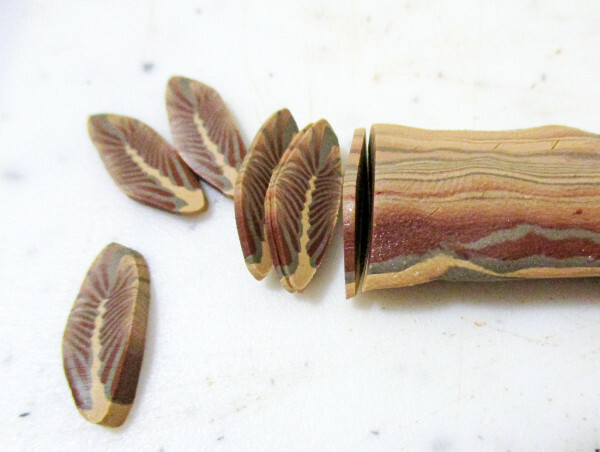 Gently press feather slices onto the wing base leaving a little overhang at the tips. Layer each additional row so your feathers overlap. 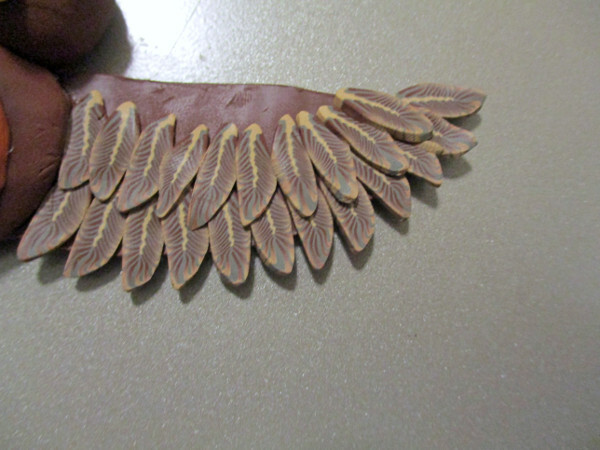 Continue layering feathers till your wing base is covered (a little showing at the top is fine). 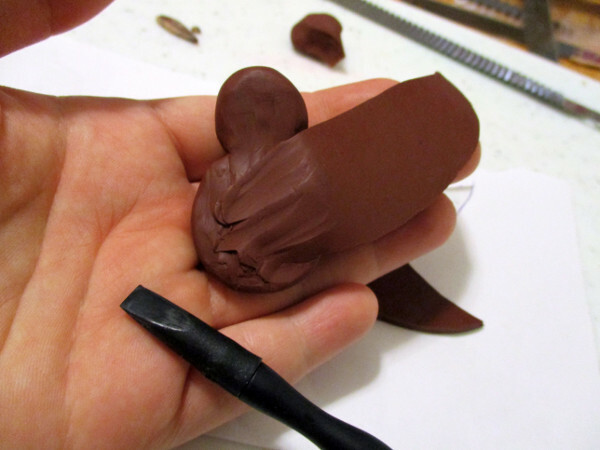 Roll out canes of brown clay with slightly pointed ends trim them to size to fit the top of the wings. 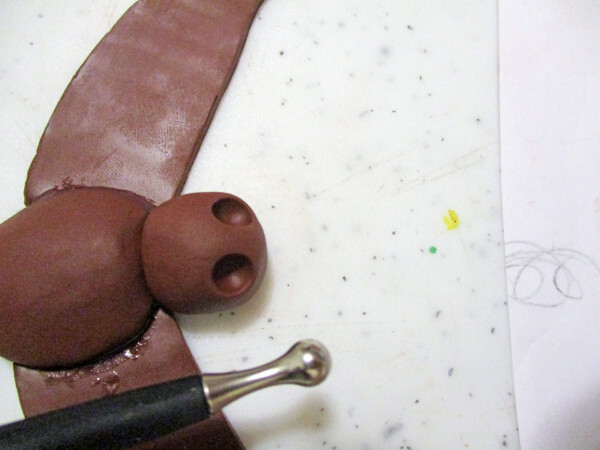 Gently press the canes to the tops of the wings for a nice finished look. 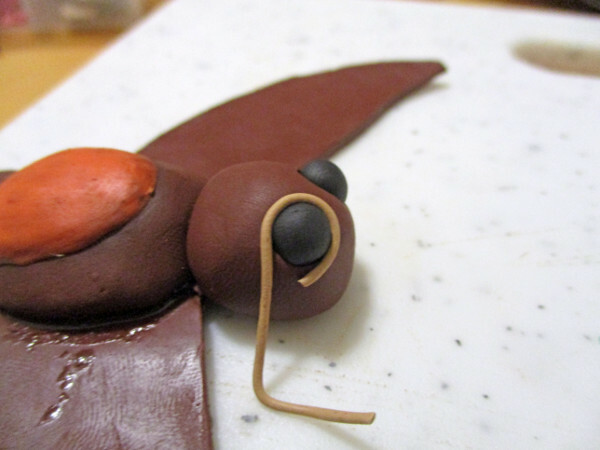 Trim and insert eye pins into each sides of the wings (dip your pins in liquid fimo for a strong bond). Due to the different thickness throughout the piece I baked for a longer time at a lower temp. I baked mine at 160 for 30 minutes. 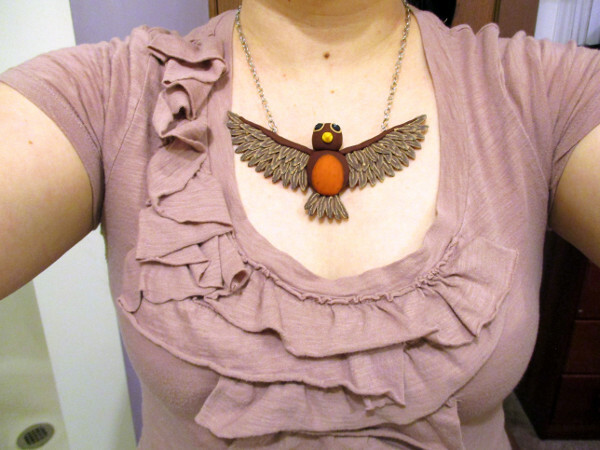 After your work is cooled add some necklace chain in the length you want and whatever type of necklace clasp you want. 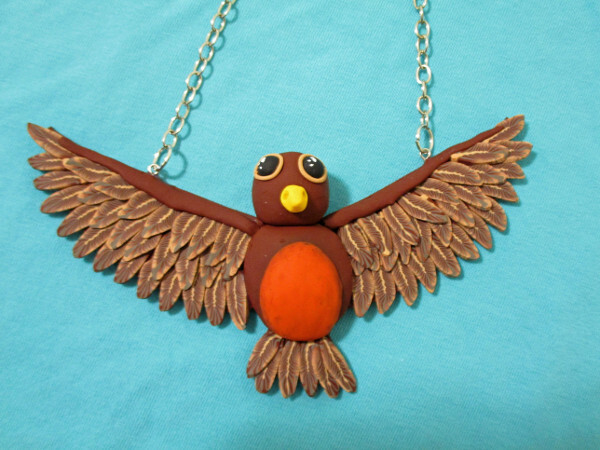 Rock out your robin necklace!